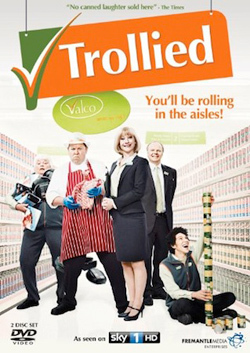 Trollied is a Situation Comedy set in a fictional supermarket, Valco in the north-west, specifically Warrington in Cheshire. It is broadcast on a Monday night at 9pm and more unusually it is on Sky 1 (it is rare for Sky 1 to commission programmes from the Sitcom genre). Trollied is repeated immediately after on Sky 2 at 10pm. In its classic 30 minute format it follows some genre conventions but offers post watershed representations. The programme is produced by Independent Production Company Roughcut TV and according to the Broadcaster’s Audience Research Board (BARB) episode 1 transmitted in August 2011 attracted 2 million viewers and now averages at a very respectable for Sky 1; 1 million viewers per episode. This is made more impressive considering it is going head to head with BBC1 and ITV post prime time like I’m and Celebrity, Get me out of Here and as result of this commercial success, and critical success it has received Sky have recently commissioned two new series. The programme has significant pedigree and was developed, in terms of idea by Ash Atalla, the CEO of Roughcut, a production company established only in 2007. He and they also developed The Office, IT Crowd and Bo Selecta – Atalla is familiar with dark, difficult humour and as a wheelchair bound sufferer of Polio as a child authorised and mentored as producer of The Office Brenda, the disabled character played by Julie Fenandez who is herself a disabled actor. Atalla enlisted industry ‘stock writer’ Julie Rutherford who has worked extensively for Kudos (also an independent production company) on Hustle, Life on Mars and Ashes to Ashes; all critically acclaimed and commercially successful Crime Dramas. Rutherford, perhaps more importantly has had experience writing for Channel 4’s Teachers and Shameless, programmes that offer similar representations and sarcastic, at times difficult tongue in cheek drama as in Trollied.